Want to escape the dreary English climate? Whether you want to enjoy a beach holiday with the whole family or a city break with friends, using an Iberia discount code to book your flights will help you make big savings. From long distance flights in search of winter sun to short hops across the channel, an Iberia promotion code can help you get away from it all for less. Founded in 1927 in Madrid, Spain, Iberia started life as a local airline providing postal transport between the Spanish capital and the city of Barcelona. During the fifties, various tourism legislations were passed that were lenient towards Spain, leading to the airline's expansion into flights to Canada and the USA. 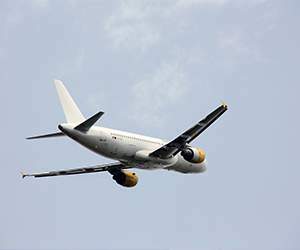 By 1981, the airline was carrying over 10 million passengers a year, and by 2002 – when the airline was privatised – over 500 millions passengers had flown with them. Today, Iberia is responsible for over 60% of of traffic at Madrid's Barajas Airport, operating an all-Airbus fleet carrying passengers to destinations around the world. Iberia flies to 17 domestic and 61 international destinations in 36 countries across Africa, the Americas, Asia and Europe, covering everything from the exotic beaches of Mexico and the rainforests of Costa Rica to the cosmopolitan bustle of Barcelona and the Gallic charm of Paris. Passengers travelling with Iberia have a range of cabin options, each offering fantastic comfort and value for money. In economy you'll enjoy at-seat internet access, personal touch screen entertainment centres and delicious cuisine, while passengers travelling in Business Club can enjoy more room to stretch out in wider seats with a greater seat pitch. Want to travel like a real VIP? Business Class offers priority service while on the ground and the highest possible level of comfort once in the air. 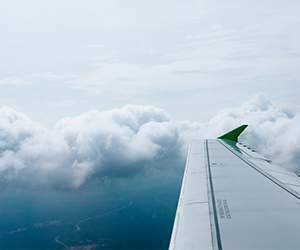 The airline is also committed to maintaining a responsible attitude towards society and the environment, with various schemes aimed at reducing the environmental impact of their flights. Iberia aircraft are currently involved in scientific projects to monitor air quality at different locations and altitudes, while company charities such as 'Mano a Mano' (Hand to Hand) use vacant cargo space to supply humanitarian need to victims of war or disasters. Want to get exploring the world with Iberia? With an Iberia discount code you can make big savings on flights wherever you go. Whether you want a family holiday on tropical beach or a relaxing city break with friends, using an Iberia offer will help you save money while you shop. Carries around 20 million passengers a year. Browse our website until you find an Iberia discount code that suits you, then navigate to their website to begin searching. Enter your desired destination and flight detail and click 'Search'. Select your outbound and return flights and click 'Continue'. Click 'Continue entering passenger details'. Enter your Iberia code where applicable. Want to discover more about Iberia? Why not check out the company's dedicated YouTube channel? You'll find lots of exclusive content designed to inspire you and your travels including destination guides, video cabin tours, travel tips and much more. You can also use this channel to find out more about saving money with an Iberia discount code. If you've enjoyed shopping for flights around Europe and the rest of the world at Iberia, why not try searching for great deals on hotels, transfers and more with Expedia or lastminute.com? Or, if those aren't up your street, you'll find plenty of other stores in our Travel section. Looking for something at Travel category and only British Airways comes to mind? Visit couporando.co.uk where you will find a lot of other shops such as Ebookers, Expedia and Ryanair. Choose your favourite coupons and rabates and save! Navigate to their website to begin searching. Enter your Iberia promotion code where applicable. Fill in your payment details and click 'Pay now'. Need to contact the team at Iberia? Whether you have a question about your booking, want to know more about individual destinations, or simply want to find out how you could be making big savings with an Iberia promo code, you can contact the Customer Services department by accessing the online help centre here. Want to explore what's happening behind the scenes at Iberia? The company maintains a profile across all your favourite social media networks. Follow them for daily competitions, travel tips, industry news and much more. You can also use these channels to find out more about saving money with Iberia codes. Don’t forget to check them regularly, as you can never be sure when a free Iberia discount code might be waiting for you! Buy now online at www.iberia.com/gb/. I've always dreamed about holiday in Greece. The ancient heritage and mystical atmosphere have always been my interests, which prompted me to look for a company that will be able to provide a suitable service for a reasonable price. After a long and thorough consideration I opted for Iberia and, trust me, it was worth it. They catered to my every wish and I came back relaxed and fully rested. 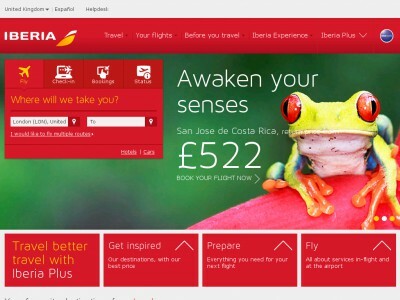 So why don't you yourself check what is there to book with an Iberia voucher code?